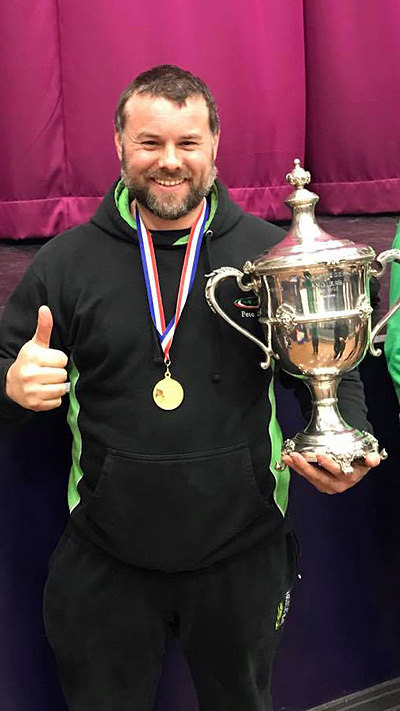 Steve Crossley and his men have won the prestigious Angling Trust Winter League final after recording an incredible fifty one (51) point score which saw no fewer than five team members achieve top five finishes from both the Fenland Drains and Peterborough’s Decoy Lakes. The team – Roger Priestley, Tom Barlow, Peter Duffy, Simon Wain, Steve Crossley (C), Franek Staniuszko, Paul Balmforth, Lee Bennett, Joe Cartwright and Josh Turbill – all put in incredible performance on the day to take away the winners medals and a cool £3,000 to hold off the challenge from the mighty Drennan Barnsley Blacks. As with any large scale team event, the key to success is putting in as much practice as possible before the big day and the chosen ten (10) from Maver North West certainly put in the hours. The team made multiple trips to Decoy Lakes and the Drains in the build up to the Final at significant cost, but all their hard work was to pay off on the day with a memorable performance all round! Below, Maver North West social media man, Pete Duffy, looks back on the team’s various practice sessions on the Drains leading up to the big day and the final itself. “After visiting the venues six times or more for practice and racking up the miles in the process with it been over a three hundred (300) mile round trip each time for the team, we knew we had to come up with a plan everyone understood and felt comfortable with – especially given the standard of the anglers we would be fishing against“. “This was my first time on the venue and with it been 0 degrees on the day and snowing, we thought we would have a hard time learning anything. How wrong we were! I ended with 17lb 8oz of roach from an area that was just 10m wide and 3-1/2 foot deep“. “For my second pratice session I went a peg past the out flow on the opposite bank. I plumbed up a top 4 to hand and it was just like fishing in Ireland – very aggressive and you had to find where the bigger fish wanted to be and I did just that. I’ve had another thoroughly enjoyable day weighing in 27lb 2oz at the end of it“. “For our third practice session, we had booked on to an open match in March town center. When I got to my peg I was expecting the river to be slow running, but it was anything but! Consequently, my rigs where all wrong! I’ve ended up with 11lb 11oz, which considering the conditions and my rigs being wrong, I was reasonably happy with. Another lesson learnt“! “I’ve gone in the bag and only gone and drawn the peg that Alex Bates had done a feature off the week before! Again I’ve fished like I would do in Ireland and come the weigh in I’ve won the match with 30lb 15oz“. “Trip five was a three day team line up Friday to Sunday. On the Friday we fished B section. There were some anglers from the health center bridge towards the swimming baths so we left a spare peg and went on the other pegs below them. I found myself on the peg where Abbi Kendall did a feature with Andy May the day before! I endured a bit of an odd start but as the day progressed, I managed to work things out. I’ve ended up having 19lb of roach. What a venue“! “The lads place themselves to the left of Wiggins Bridge. We drew our pegs from the Bridge to the back of the famous hemp boat. I drew a good area in front of the hemp boat and, again, a funny start I had a cracking couple of hours on the seed. I’ve ended with 21lb 4oz and I thought then that the weekend couldn’t get much better – well it did“! “For this seventh and final practice for the team, my drawing arm didn’t disappoint again and I drew the peg to the right of where I had 30lb from the week before! A superb all round performance from the team saw a total of five top five finishes in each man’s respective section! “The day of the final was eventually upon is and what can I say?!?! The lads for some reason gave me the job of the draw and, to my relief, I managed to draw well for the team“. “I drew peg 17 in C section, which I didn’t fancy to be honest, but I had a job to do. There was a big gap in my section because of the boats so everyone had plenty of room. There had also been lots of reports of fishing topping in the area the night before so I knew that with some good anglers on there, I would up against it“. “I had a nice steady day fishing bread to catch fifty one (51) fish to weigh 2 kilo 360g, which put gave me sixth place in my section. The two pegs either side of the gap all had 3 kilo plus weights“. “Back at HQ we’d worked out for ourselves we had fifty one (51) points. With fifty (50) points winning the event last year, we were fairly confident of a decent finish. Upon confirmation of the top three, we managed a sneaky peak at the cheques and noticed our name was already written on the winner’s cheque so we knew we had done enough“. “We are over the moon to have won one of the biggest team match events around“.